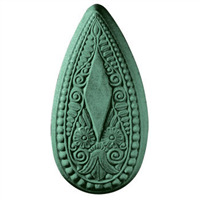 The Brooch Soap Mold is sculpted to resemble an ornate brooch that would be worn by royalty. 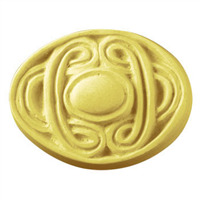 Create soaps using this mold with a shimmering mica powder for a more genuine-looking brooch. Bar Cavities: 3 Bar Depth: 1 1/8"
Bar Length: 4 1/2" Bar Width: 3"
COMMENTS: I just received this mold today and was anxious to make soap. 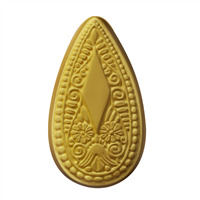 This is a very large size soap, but so beautiful! I had no problem getting the soap out at all. I simply let the soap rest and then place in refrigerator for a bit. With the right pressure in the middle of mold, it pops right out! Such a show piece! • I would also love it in a small version! 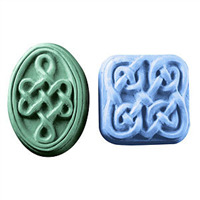 COMMENTS: This mold makes a beautiful mp soap. Customers love how pretty the bar looks.